Ai Weiwei, Trace, 2014, Legos, dimensions variable. In With Wind, 2014, statements about freedom and its fragility by Nelson Mandela, Edward Snowden, and others are handpainted on a large dragon kite, one of many tethered to the ceiling of a bunker where inmates once worked difficult jobs, which were nevertheless coveted as a reprieve from their usual confinement. 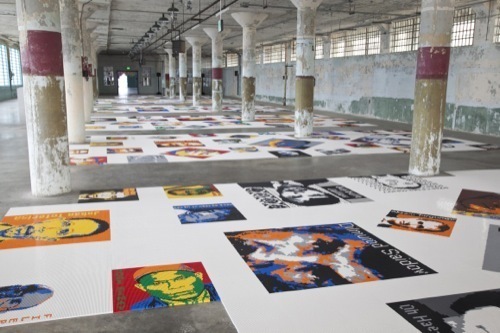 This and other compelling works, such as a vast carpet comprising a million Legos that depicts 176 prisoners of conscience around the globe (to whom visitors can send pre-addressed postcards by participating in another of Ai’s pieces), educate the audience—many of them unaware they would encounter an art exhibition during a visit to the island—encouraging them to contemplate the state of international human rights. One quote on the dragon is from Ai himself: “Every one of us is a potential convict.” The statement hits home in the United States, where the incarceration rate is higher than any other nation on Earth.